Spain is a stunning European country with splendid scenic views, a robust culture, and plenty of romance. One of the things you’ll fully fall in love with when visiting this spectacular place is the food. Spain has some of the sexiest food on the planet. You’ll fall head over heels for the food there. If you’ve never experienced Spanish cuisine, here is a guide of 20 of the best dishes to try in Spain. Tapas are small plates that Spaniards will eat at any point during the day. You can find them anywhere and in hundreds of varieties. It’s not specific to one dish. In some place, you’ll even receive complimentary tapas just for ordering a drink although it should be noted that they aren’t free everywhere you go. Having tapas in Spain is an essential way to experience the culture and the flavors here. Plus, it allows you to sample more delicious tastes than ordering larger plates. 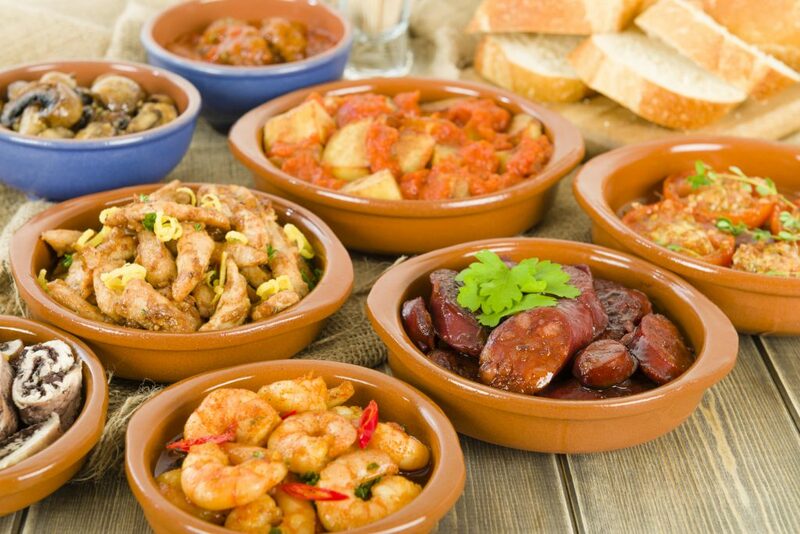 You’ll find so many tapas to tempt your taste buds while visiting Spain. In Spain, eat breakfast the way the Spaniards do, by enjoying tostada con tomate. Toasted slices of baguette are adorned with a blended mixture of tomato and olive oil, seasoned with salt and pepper. It’s simple yet fantastic. If you’re hankering for something more, you can order jamón with it too. 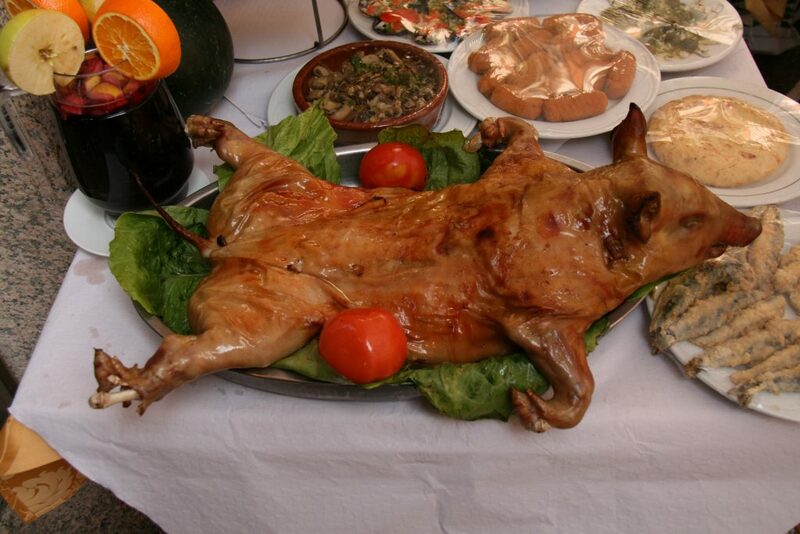 Be advised that most restaurants only serve this dish prior to 2pm, the typical lunch time in Spain. However, you can order tostada con tomate any time of day after that. 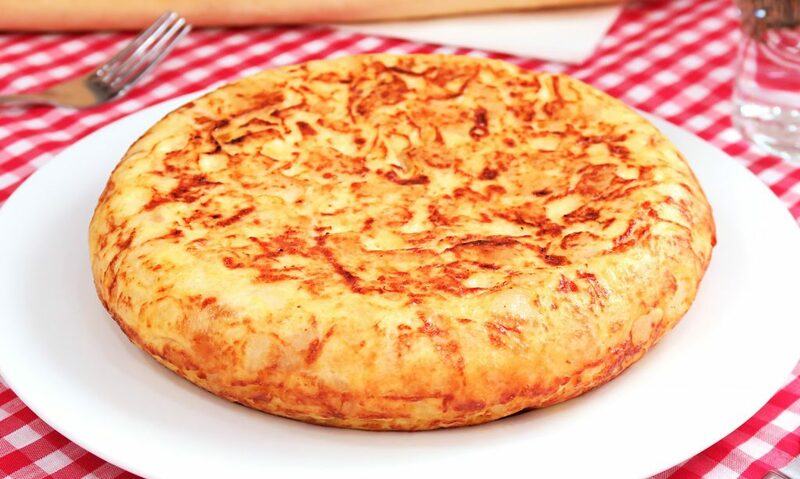 Tortilla Española is a Spanish omelette. It’s another simple offering that is big on flavor. The key here is the tortilla. If you wind up with a dry or overly salty tortilla, you’ll be disappointed. Look for places that are well known for their tortillas and you won’t be disappointed. The locals as well as your hotel concierge can point you in the right direction. As for the omelette, it can come in a variety of ways so you’ll have fun tasting them all. Perfectly refreshing, especially on a hot day, ajo blanco is a cold soup. It is made with almonds, garlic, olive oil, vinegar, and bread that’s a day old. It’s then topped with jamón, melon, and grapes. 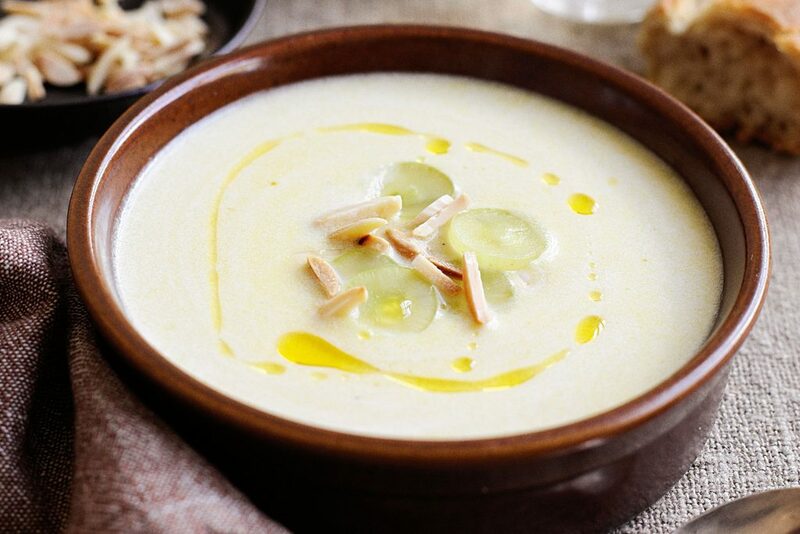 It sounds like a strange combination but this thick and creamy soup will become your favorite fast. 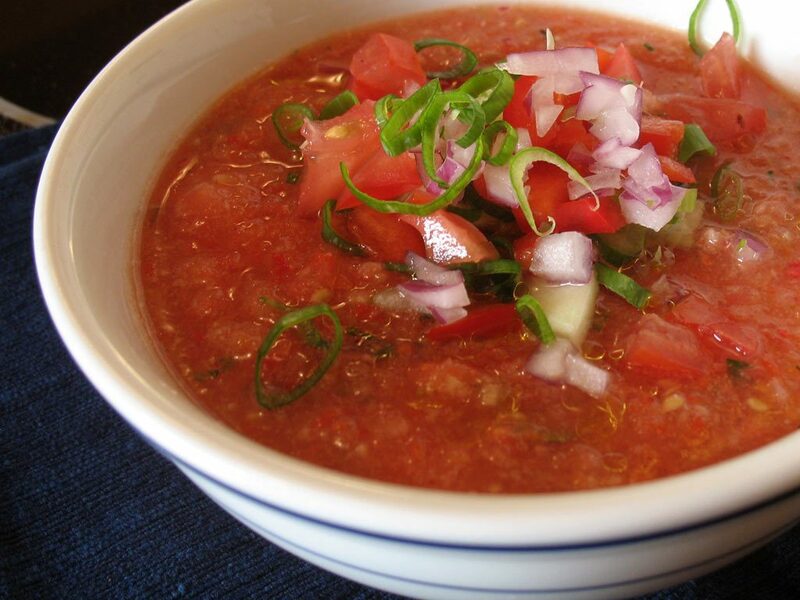 Gazpacho is the cold Spanish soup you’ve likely already heard of. It consists of tomatoes, olive oil, vinegar, cucumbers, onions, carrots, and garlic. 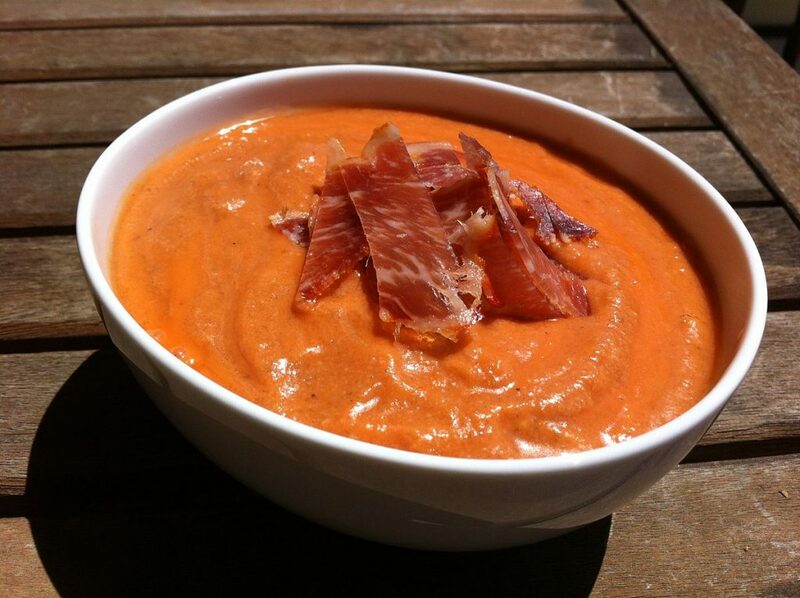 Each region of Spain has a version of gazpacho. If you find that you like it during your travels through Spain, go ahead and order it in every region you visit. 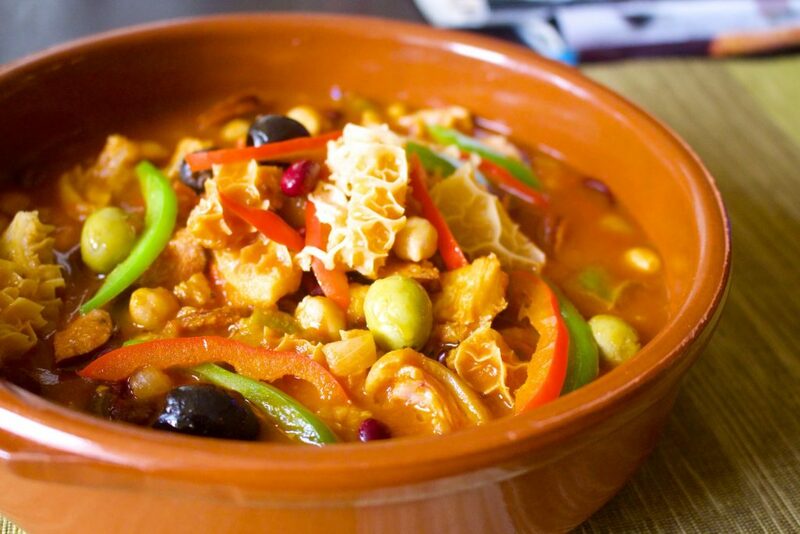 It’s fun to discover the subtle differences each region imparts on this iconic Spanish soup. Do you like fries? 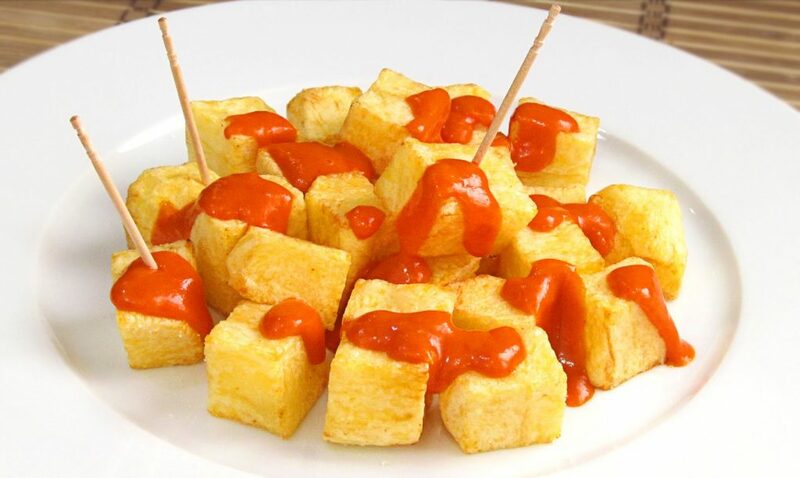 Then you’ll love patatas bravas. This dish features fried chunks of potatoes that are covered in a red bravas sauce which is made from tomatoes and cayenne. It’s a bit spicy, but nothing you can’t handle. The sauce is what makes it amazing. It goes great with late afternoon cocktails and plenty of friends to share it with. 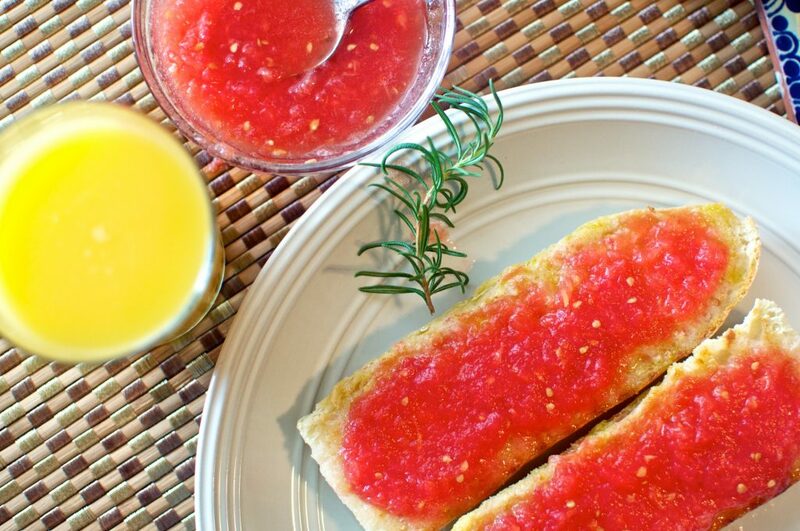 This is a healthy offering that features a blend of fresh tomatoes, garlic, olive oil and salt. Don’t forget some day-old bread too. It needs to be hard. The bread is topped with a boiled egg, jamón, and olive oil. You won’t notice the bread is a day old. It’s commonly served as a tapa. It’s also something you can make at home once you return and long for the tastes of Spain. For those that love seafood, this is a must! It’s one of the most famous dishes in Spain. It’s cooked octopus that is sliced into little pieces. The octopus is then drizzled with a little olive oil and peppered with dashes of cayenne pepper. You’ll find it on almost every menu and once you taste it, you’ll likely order it continuously throughout your trip. It is something you will find yourself craving daily. 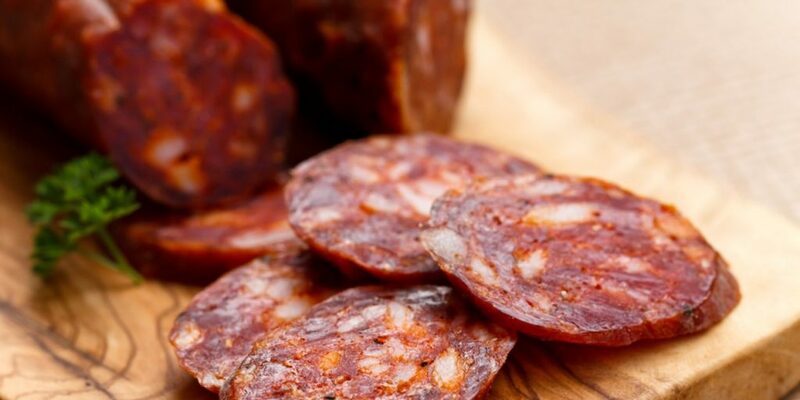 Chorizo are spicy sausages of pork meat. They hail from the Iberian region and you can’t miss them with their fatty, red, plump and juicy bodies. 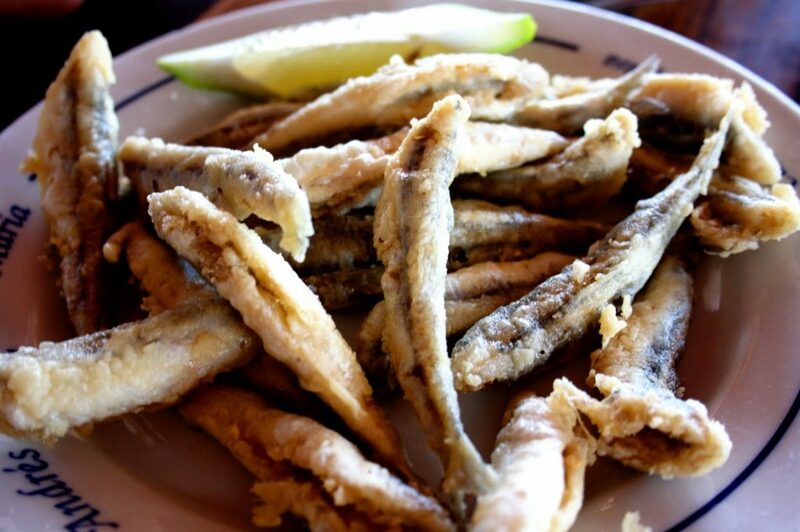 Try them fried up as an entrée or tapa. They’re also amazing served cured inside a sandwich. Chorizo is the kind of sausage that will make all other sausages seem tasteless. Even more famous than chorizo is jamón ibérico. It’s a type of cured ham that is only made in Spain. It’s made from the meat of pigs that stick to a special diet. You’ve tried ham, but until you try this ham, you won’t even know how incredible it can taste. It’s like the difference between bacon and prosciutto. 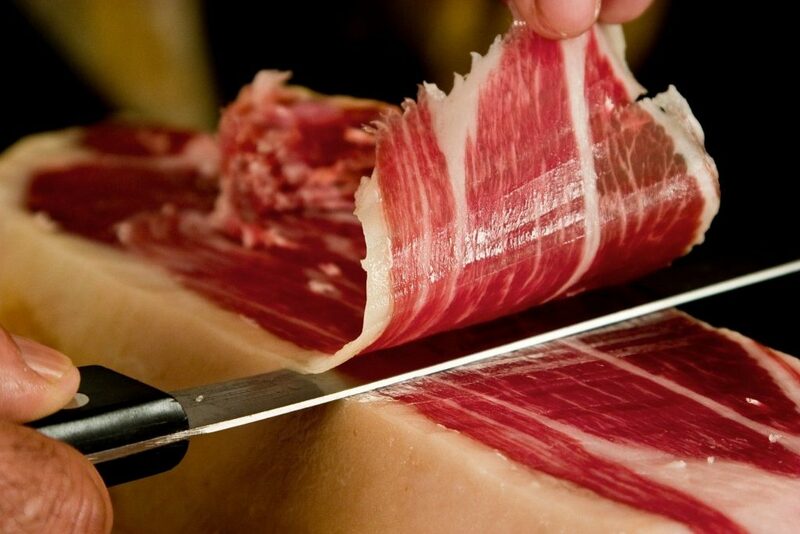 Jamón ibérico is just leaps and bounds beyond any delicious ham experience you’ve ever had. You’ll find yourself gobbling up as much of this as you can get while you’re in Spain. Don’t count your calories on your vacation to Spain. 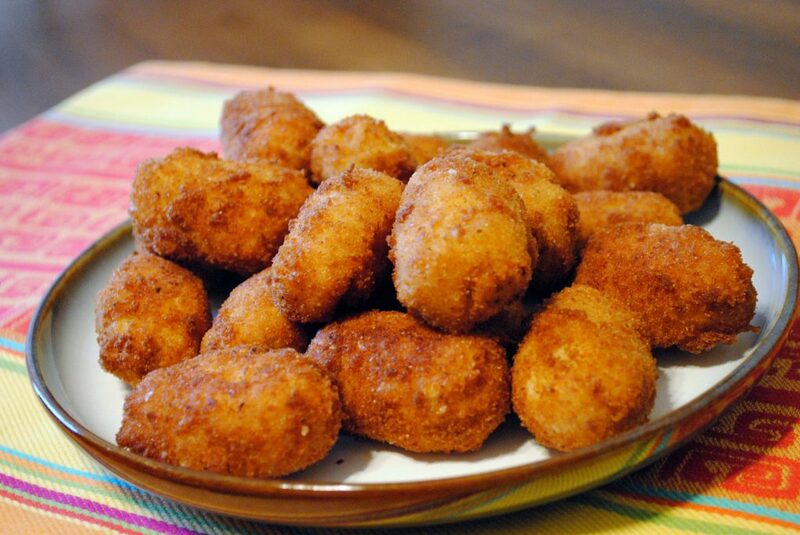 For if you do, you’ll miss out on trying croquetas. They’re full of calories, but you have to taste them at least once. There are many varieties of these fried balls. You’ll even find them with jamón tucked inside. There are also varieties that are stuffed with gorgonzola cheese and spinach. They are nothing short of heavenly! While Spain is definitely known for its succulent assortment of meats, if you want to get your veggies in or desire another meatless option beyond the tomato-based items, try this dish. 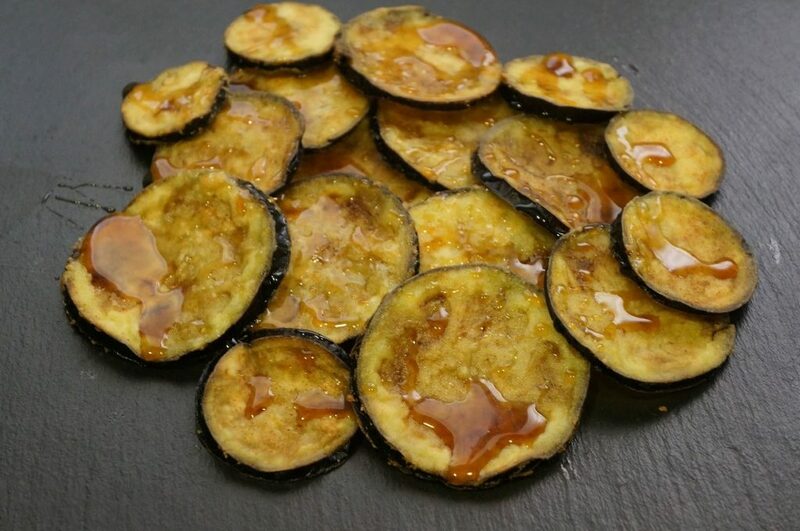 Berenjenas are eggplants, and in this dish, they are fried with molasses. You’ll see them often in tapas bars. It satisfies on so many levels! You can’t have a list of foods to try in Spain without including paella. It’s probably the most famous Spanish dish in the world. However, getting the good stuff is important. 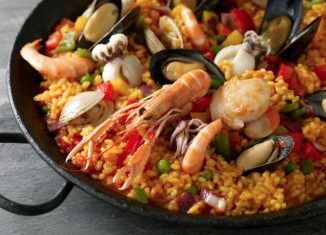 If you go to the tourist trap dining establishments, particularly in Barcelona or Madrid, you will come away with a very poor impression of paella. 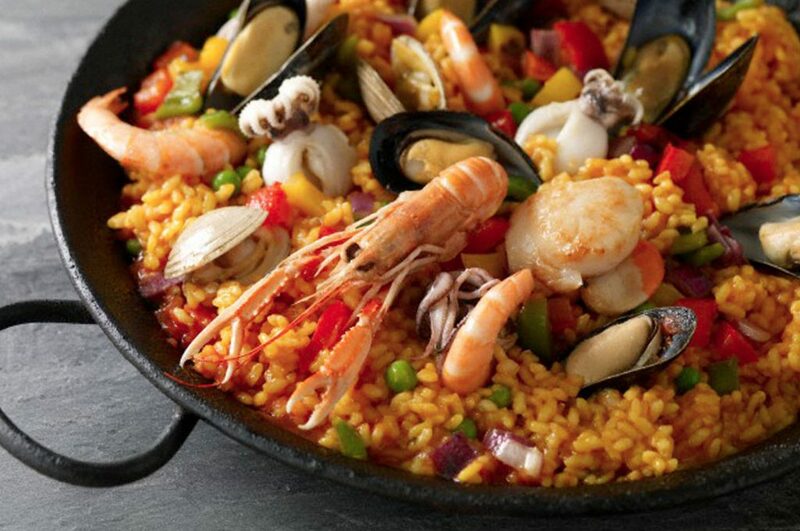 Ask your hotel concierge or any locals you meet for recommendations of places to try good paella. It’s revered in Valencia, the place of its origin. The best version of this rice dish is flavored with saffron and comes bursting with prawns and mussels mixed in with vegetables. You’ll also find varieties that include chicken or rabbit, and some that feature black rice thanks to coloring from squid ink. Callos is for the more adventurous meat eater. It’s a stew that is made with the intestines from a variety of different meats. Chewy bits of beef or pork are typically mixed with beans, chorizo and more meat. It’s not for everyone, but it sure is worth a try. You’ll either love it or hate it. If you enjoy fish, you’ll love pescaito frito. It’s simply friend fish and it comes in dozens of forms. You’ll see it as tapas from fried calamari to anchovies and beyond. It makes for a perfect pairing with a cold beer. Share with friends and enjoy dining al fresco on the terrace so you can people watch, drink, and munch away your day in Spain. 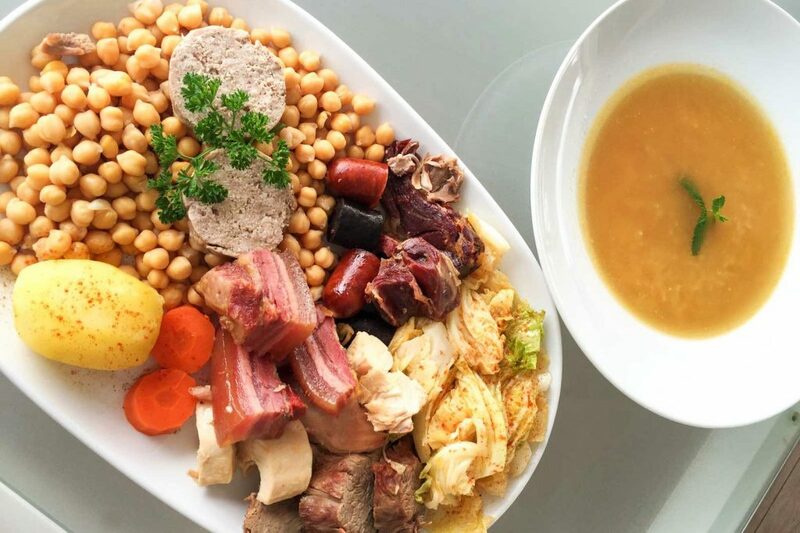 From Madrid, this delightful stew is rich with thick cuts of bacon and chorizo with garbanzo beans and cabbage. It has a bit of variance to it with other ingredients, but you’ll always find this hearty dish completely satisfying. It’s especially wonderful if you’re visiting in the winter. It will warm you through your heart and soul. Cochinillo is roasted suckling baby pig. On the outside, it gets a slight crispiness to it. The inside is a perfectly moist, soft, and gratifying experience. You’ll find it in many restaurants, particularly in the northern regions. Stewed oxtail, or rabo de toro, is often served as a tapa but you’ll also see it as a full dish. 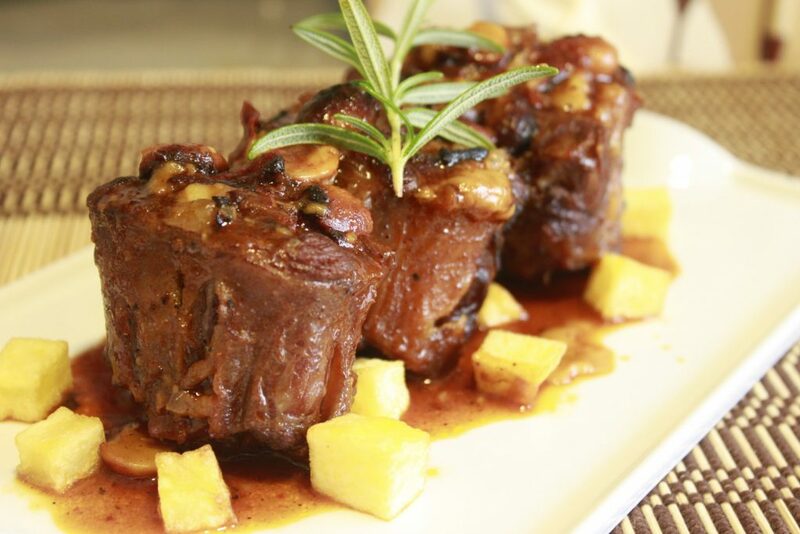 It’s a flavorful dish with oxtail and vegetables that is as fragrant as it is delicious. It’s very filling too. As a tapa, it’s perfect for filling up without overdoing it. Though if you’re ravenously hungry after a day of sightseeing, having this as a main dish will completely satisfy. This intensely popular Spanish dish sounds ordinary, but don’t let that stop you because it’s truly extraordinary. 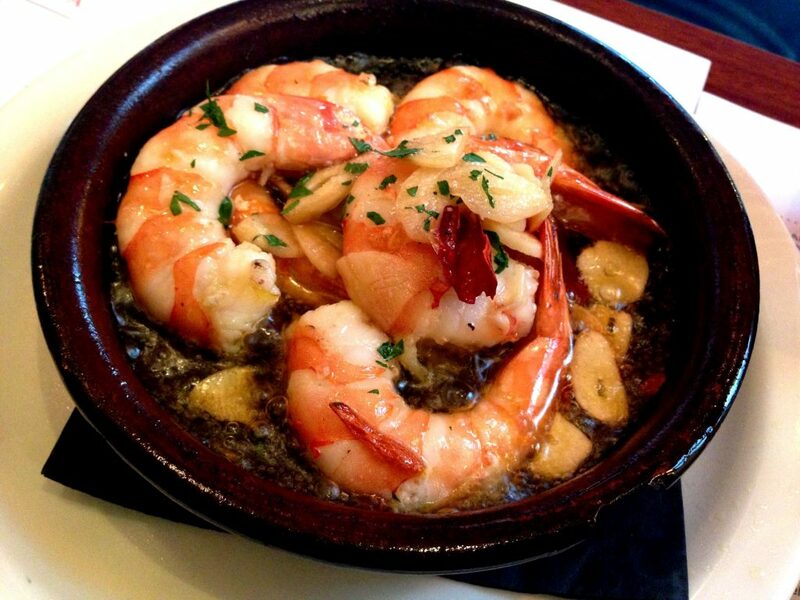 It’s a garlic shrimp dish you’ll often see served in tapas form, particularly in the southern regions of Spain. Shrimp and garlic come together with olive oil, dry sherry, fresh lemon juice, sweet paprika, and fresh parsley. The sauce alone is something you’ll do everything you can to scoop up the very last drop. Every shrimp dish you have after this will pale in comparison. Churros are a famous dessert that are from Spain though Americans will find them in Mexican fast food places like Taco Bell or famously at theme parks like Disney World. But don’t let that put you off from trying the place of churro origin. These lengthy pieces of fried dough are even better in Spain because they are served with melted chocolate for dipping. Some Spaniards will also sprinkle sugar on them before dipping them into the chocolate for an extra-sweet treat. 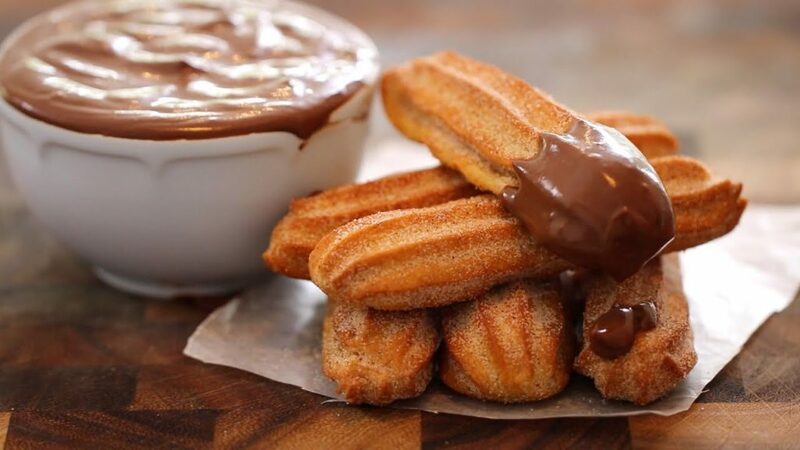 You’ll find these churros in just about any café you come across. When you need an extra indulgence, the churros in Spain will truly satisfy. Spain has so many more amazing things to taste, however this list will definitely get you started. It can be overwhelming going to a new place and not knowing what is recommended. These dishes are some of the most renowned of Spain and will give your palate many ways to rejoice during your trip. 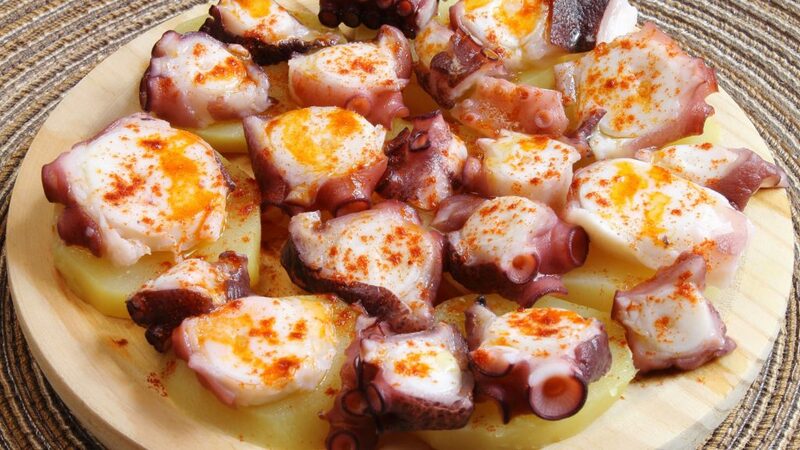 Do you have a favorite dish from Spain that’s not on this list? Let us know what it is and why you love it!